Some things never change, and some things really do. (Eyebrow styles, for example. I bet you I can date the production year of ANY historical film, show, or play based on the actresses' eyebrow shape, which is almost never historically accurate.) I am finding over and over again, as I research history, that when tastes change, historical representations for modern audiences tend to prudishly cover up those juicy, exciting, weird, and wild elements of our material heritage so as not to distract from the hypnotic illusion that people have always been much the same, from one era to the next, so that we can imagine drifting through time and experiencing life in many different centuries, in many different lovely costumes, but with our "natural" standards of beauty and our perfectly groomed eyebrows intact. This is a dull and traitorous lie. As I research history and how various fancy-pants people lived in the tenth and eleventh centuries, it is interesting to find those pieces of everyday life and observations that sound ageless and familiar. But they are so much more poignant when imagined as part of a world that is so unrecognizable to the modern eye that the people may as well be space aliens. Everything that cries in the night is wonderful. With the exception of babies. There are also beautiful lists of lovely things which modern readers find lovely to read a thousand years later. Wisteria blossoms. Plum blossoms covered in snow. Lady Shōnagon's accounts of her affectionate relationship with her Empress Teishi almost give off the floral scent of love letters. Since I had forgotten to bring along any suitable paper, I wrote my reply on a purple lotus petal. placed near the outer edge of the gleaming wooden aisle-room floor, the low standing curtain pushed to the back of the room in a quite unseemly way. – it is pale greyish-violet with deep violet inner lining, the outer surface a little faded, or perhaps it is a stiffish robe of rich gleaming damask. Beneath this, she is wearing a clove-tan or yellow gossamer-silk shift, and the long strings of her unlined scarlet skirted trousers trailing undone from below the hem of her clothing tell us that she must have fallen asleep with trousers still untied after her lover departed. The soft luxury of hair that lies piled in waves beside her speaks of its wonderful length. I do wish men, when they're taking their leave from a lady at dawn, wouldn't insist on adjusting their clothes to a nicety, or fussily tying their lacquered cap securely into place. After all, who would laugh at a man or criticize him if they happened to catch sight of him on his way home from an assignation in fearful disarray, with his cloak or hunting costume all awry? Oh, how I wish historical re-enactments shared that yearning to let the reality of the past linger for all to see! I find the contrast of obsolete beauty standards and fashion trends with modern life to be fascinating, exciting, and downright heavy metal at times. I'm saddened that so much is constantly scrubbed from our fictionalized windows into the past, to make everyone seem prettier and daintier to our current sensibilities. For example, remember the Wolf Hall miniseries on PBS? So much care was taken by the set designers and costumers to recreate a historically accurate portrait of the times... except when it came to the codpieces. Apparently the real ones of the time were so large and outrageous that the producers feared they would distract from the drama of the film. I'm not sure I agree. I think that if the show had been populated by men wearing giant dongs like fanny packs, I might have watched more than half an episode. I guess I'm just so much more mature and sophisticated than the average PBS viewer. Lady Shōnagon who, in her private diary, mercilessly mocked the lower classes and those with inferior tastes in hairstyles and dress? 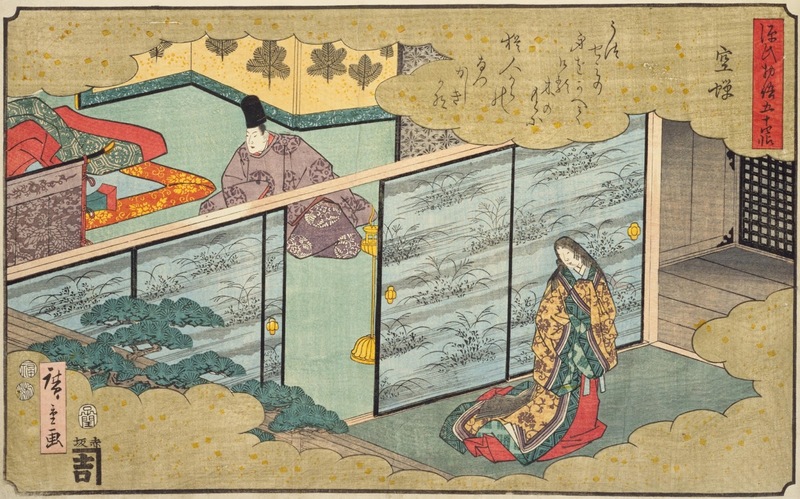 What did a high maintenance woman of the Heian royal palace look like? Can you imagine? Well, probably, she would have had a mouth full of fashionably blackened teeth to contrast with her white makeup. This dental trend lasted for many, many centuries through and beyond medieval times in Japan, and it was such a traditional and expected look for women that an empress in the late 19th century made a huge splash by appearing in public with white teeth. 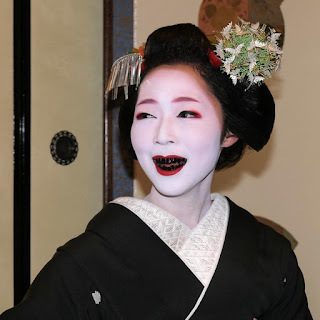 To this day, there are places in Asia where tooth blackening continues. And what does this have to do with me and my book? I guess you will have to read it and find out during the interracial lesbian hot tub scene. I'm in 160 pages deep. The leaves are changing color here and in imaginary Vepres--Oh, foreshadowing! The leaves will soon fall, the skies will open through the bare branches, and buried secrets will come to light. That is, if I can get this draft done. Kindergarten starts in TWO WEEKS. Merciful bureaucracies!